I had had a chance to travel to Goa many times. But, I had never shared my travel experiences in Goa so far on my blog. My reasons being, Goa is a well-known destination, and the beaches need no special introduction. Well, over a period of time, when my longing for the offbeat places grew, I discovered there was a lot more in Goa if I could manage to get away from the beaches. So I finally did get away this time. 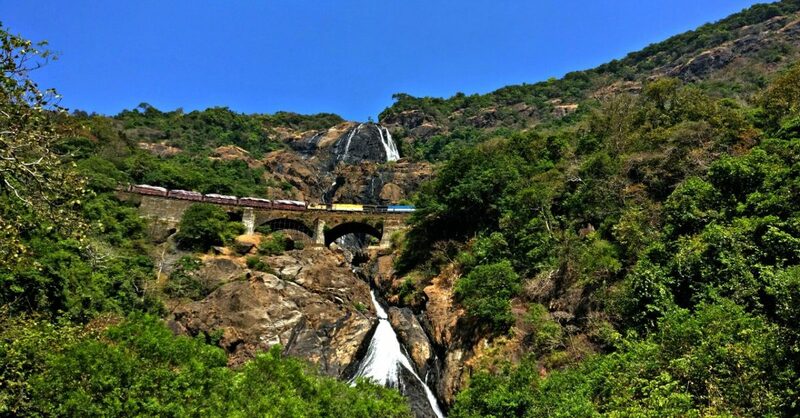 Visiting the popular Dudhsagar waterfalls was on my list for long. Although the place is now a touristy one, it’s beautiful and I wanted to go. So I came across Dudhsagar spice plantation when I was looking for some places that I could visit around Dudhsagar, and this is how I coincidently planned this trip on a long weekend. Dudhsagar Spice Plantation – A Farmstay in the Wild! Goa and Karnataka share a dense forest area, rich in flora and fauna. Close to this reserve forest, there are a few villages that are secluded. Karmane is one such place. 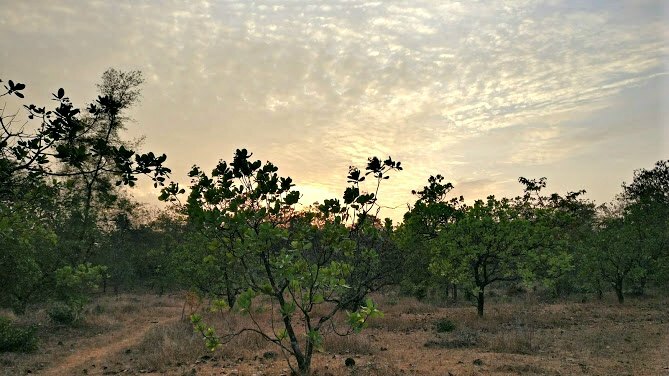 Dudhsagar plantation lies in this region, away from the part of Goa that most of us know, which makes you really wonder whether you are still in Goa while you are here. I changed three buses to reach the plantation which lies secluded. 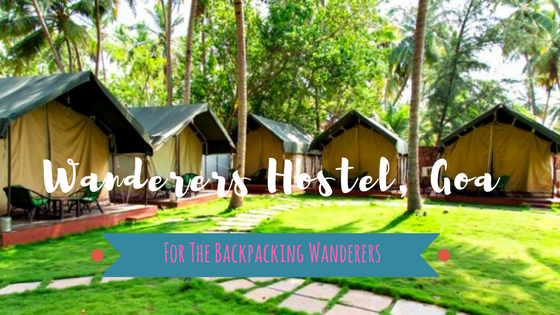 The best way to reach is to drive to this place, as you can easily hire a two-wheeler in Goa for wandering. I had to skip this as I had other plans. I was welcomed by rows of trees with the birds chirping, and soon I realised it was a typical tropical palm garden. Thanks to the greenery, I forgot the hot weather of Goa as the cool breeze soothed me. Ashok, the owner of the farm stay warmly welcomed. He introduced his Indo-German family and we casually chatted over the welcome tea in the lounge area. The place was bought by Ashok’s father and he has developed this plantation from the scratch, which is quite huge. We began walking around the plantation just when the evening had set in. 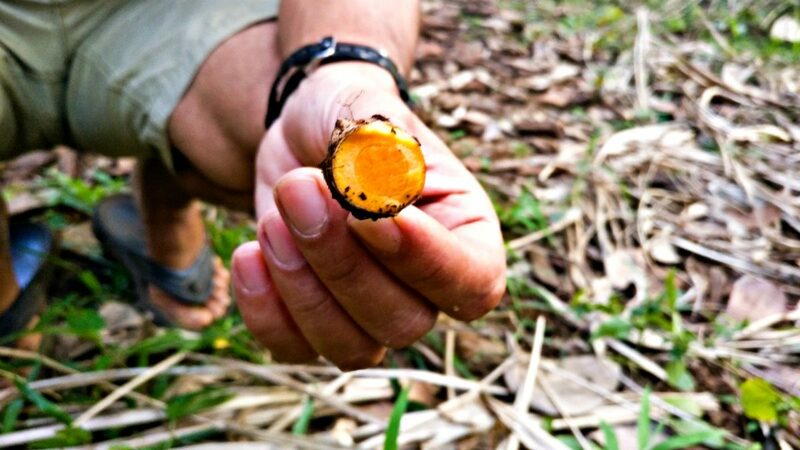 For the first time, I got a close look at how the yellow turmeric, white ginger, cardamom, lemons and baby potatoes are grown on a plantation. Apart from the pepper, chillies and cashews, many vegetables are grown here, and the guests get to taste organic food always. 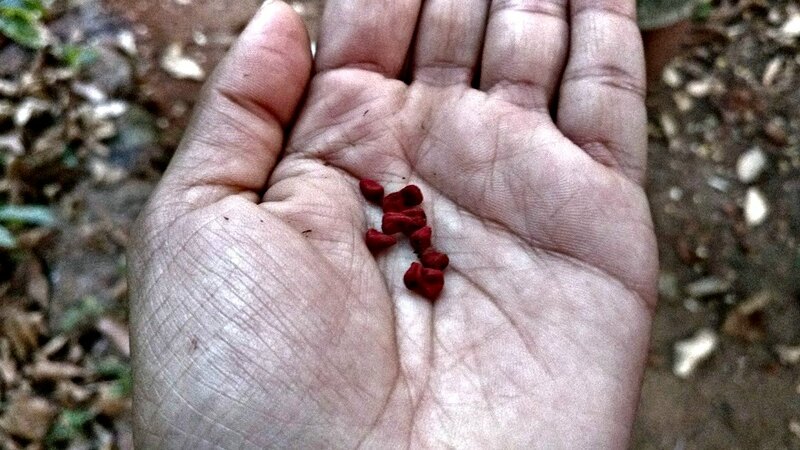 I saw plenty of plants that I had only heard of till now, including the plant whose seeds are used for coloring. It was an educative tour that lasted for about an hour, and I realised that a lot of work goes into maintaining and developing plantations. It’s not just a stretch of field where one or two crops are grown. Scores of plants and trees are grown simultaneously, and it involves a lot of things to be done. Dudhsagar spice plantation also has a distillery of its own for Fenny, the renowned signature drink of Goa, made of cashews. Once in a year, the fruit part of the cashews are collected and crushed in a place (similar to wine). The juice is collected and steam is allowed to pass from a furnace in a regulated manner. After a few days, Fenny is obtained. Extreme care is taken at each step since a slight variation can alter its taste to a great extent. I had tried some Goan cuisine, but all of them were in restaurants. So here I had a chance to savour home-made Goan vegetarian dishes – No bad fat or no fried items. The curry and the sabzis prepared with coconut and spices were simple but tasty and fulfilling.Prepared with home-grown, organic vegetables and spices, I can say that it was one of the best cuisines that I have tried! 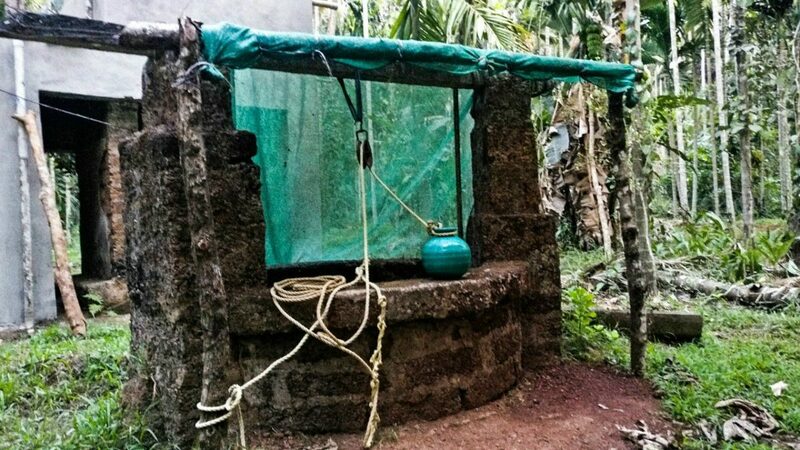 Depending on the season and your duration of stay in the plantation you can visit much less know places in this part of Goa. The most popular are Dudhsagar waterfalls, located at Kollem, about 10 km from Karmane. You can reach Kollem by bus, which arrives every half an hour (you can board one on the main road, a few steps away from the plantation). From there, jeeps take you to the entrance of the waterfalls. No other vehicles are allowed inside the reserve forest. They charge about 400 per head, and you need to mandatorily rent life jackets that cost 30 rupees. It is a 45-minute ride within the sanctuary. 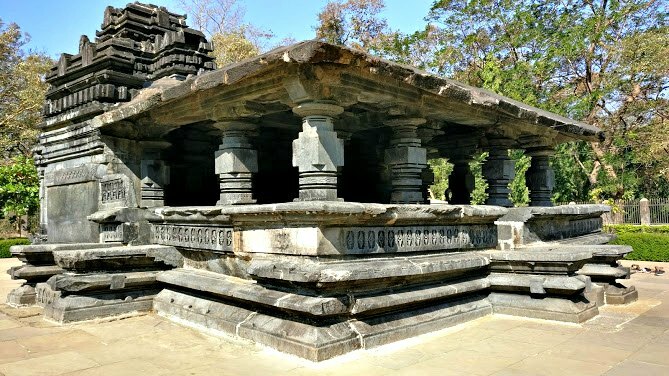 About 25 km from Karmane, Tambdi Surla Mahadev temple, the oldest temple in Goa is located. I have written about its interesting facts here, which will for sure make you head there! A few minutes walk away from the plantation, there is this river that flows amidst the dense forest of Bhagavan Mahavir National Park. It’s a nice place to have fun in the shallow water, and few minutes into water, I didn’t want to leave this cosy place! I spent most of the time in Dudhsagar plantation itself since it was a retreating place, with all the tropical garden for myself. If you have a few more days or are keen on traveling around, check here to find out the activities that you can do. It is a cheap but a tedious drive if you hop on to the public buses to reach the plantation. You should take a bus first to Ponda from Panaji. Next, take a bus to Sanvordem. From here, it’s another short bus ride to Karmane village. The plantation is 5-minutes walk away from the last bus stop in Karmane (landmark: the stop after the poultry farm). You can directly call or mail to book your cottage. 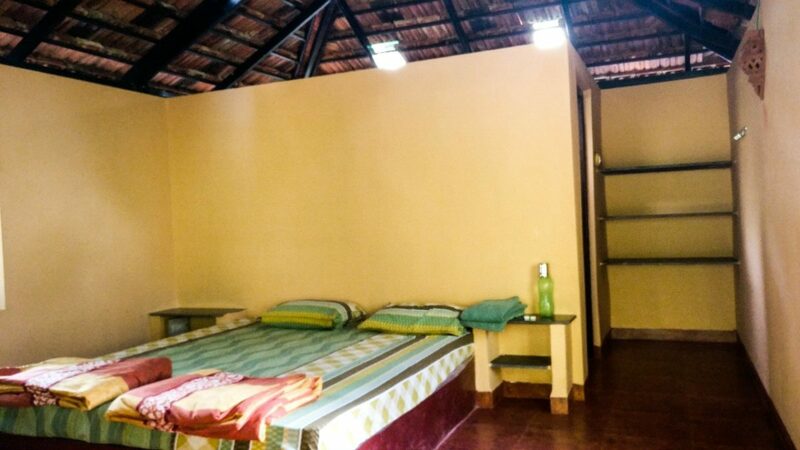 However, since there are a limited number of cottages available it’s always better to book in advance as it gets full soon during the vacation time. The property is listed online and you can reserve here. If you need a discount of 15% on your booking, you can also book here on Airbnb. It was a unique experience to me in Goa as I traveled to places off the beaten path. I ditched the beaches for better after all. 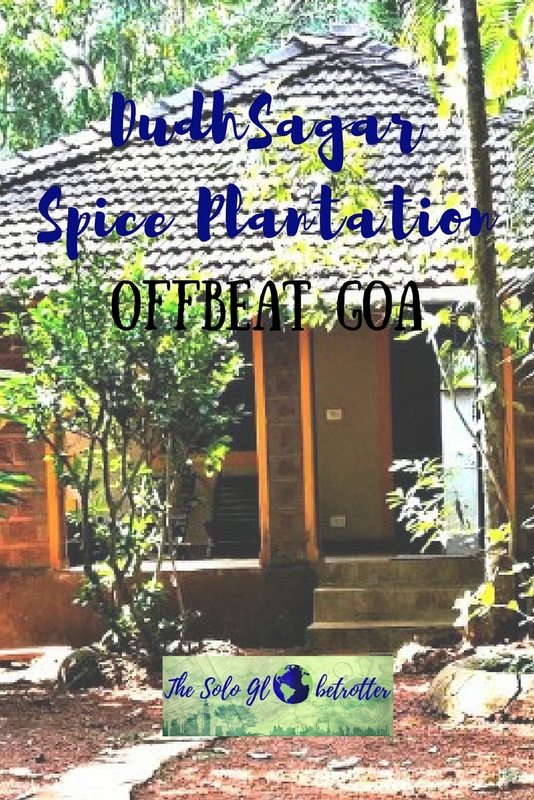 If you want to take a break from the beaches in Goa or want to idle away amidst a tropical garden or if you are just curious to learn how to make Fenny, then you should check out Dudhsagar spice plantation! 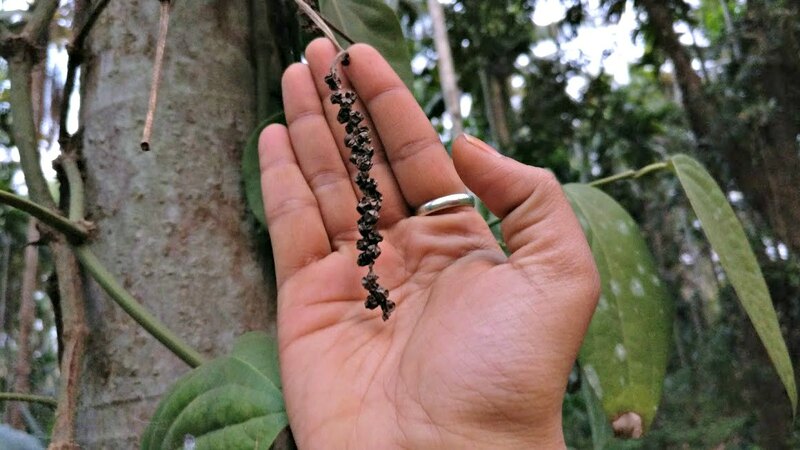 PS: I wrote this post in collaboration with Dudhsagar spice plantations. However, all the opinions and views are my own. Connect with me on Facebook, Twitter, and Instagram for travel inspiration and stories! Subscribe to my posts by email for travel stories.